The only parts of the armor not in these pictures are the ugly mitten gauntlets, gorget, and round shield. It has all the other required and recomended armor stuff hidden under leather because most of it would not look right on this suit. 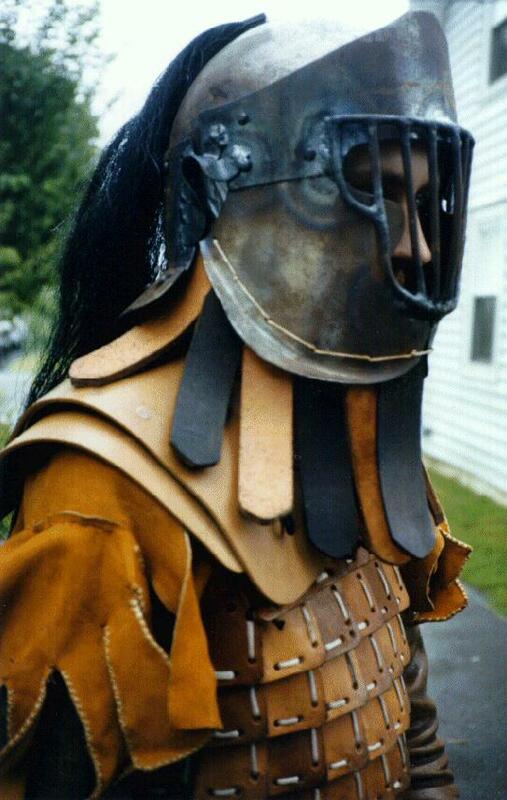 I consider this to be a good combination of "modern sports armor" and armor that looks reasonably period for my SCA persona... some sixth centery guy living somewhere in the British Isles where armor has not changed much since the fall of Rome. This suit of armor is 98% ductape free. The padding inside the helm is held together with ductape, as can be seen through on of the ear holes in the pictures above... This helm, if I recal was my second attempt at a helmet, before I learned to weld and before I had any idea that I should try using some type of grinder to smooth down my welds.